Cam's Cinematic Episodes: Are We To Expect A SUPER Summer 2009??? Are We To Expect A SUPER Summer 2009??? 'Ola! Well, looks like my Friday new release format has crashed after one consecutive week. Don't blame it on me! Blame it on a lackluster group of film debuts. Babel? Interesting, but not sold. Catch A Fire? Za? Saw III? What can I really say other than I thought the 2nd one was a disappointment and I have little anticipation for this one... Oh, and that it wasn't even screened for critics (Never a good sign...). So, I'm choosing to spend my time writing about something else... Something... SUPER!!! Okay, before I plunge into the brightly colored abyss, let me make a few things clear. I loved Superman Returns! Not liked, LOVED! I thought it was a brilliant reinterpretation of the character and a great way to re-vamp the franchise. 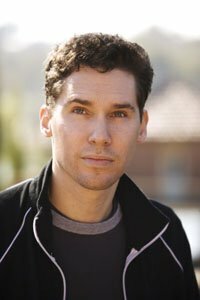 I also think director Bryan Singer is a genius! 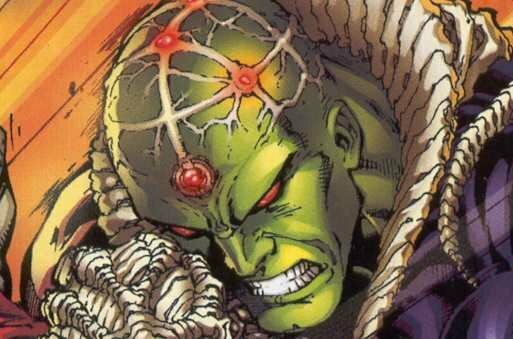 This guy made the X-Men franchise what it was (Before Brett Ratner lowered the bar a bit with X-Men: The Last Stand) and I think he's been unfairly criticized for Superman's darker tone. Now, I'm sure you're wondering what the hell I'm talking about! Believe me, that is not an uncommon thought. My Iron Man entries draw the same sort of reaction. Or so I'm told. Anyways, it was announced today throughout the web (Though my main source was Ain't It Cool News: http://www.aintitcool.com/node/30528) that Superman Returns (Henceforth referred to as SR) has finally crossed the $200 million mark. Now, this is pretty blah news to base an essay on, so it gets better! That box-office accomplishment was the necessary incentive for Warner Bros. to green light a sequel. So, Bryan Singer has signed to return, bringing with him Brandon Routh (Superman), Kate Bosworth (Lois Lane), and the whole supporting cast. Now this is exciting news! The budget is a bit smaller ($140-$175 mill) to accommodate SR's gross (SR's budget? $204-$208 mill! Yowza! ), but that's still more than enough to make another spectacular movie! There were a lot of complaints that SR was too solemn (Depressing, even! ), and not "FUN" enough (Wasn't that X-Men 3's problem? Too much action, not enough drama? Make up your minds, people!). Singer has resp onded to these comments, promising that he's gonna go all "Wrath Of Khan" on this one! What does that mean? Ummm... Ricardo Montalban bearing his chest a lot, and caterpillars crawling in people's ears? No, apparently he means action-packed and exciting. 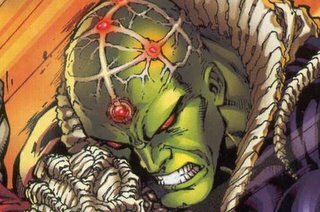 He's promised a new cosmic villain (Rumors are swirling around that it's Brainiac [pictured]) in an attempt to get some new blood after many felt Lex Luthor wore out his welcome in SR. Personally, I loved Kevin Spacey as Lex and hope he comes back, even if it's in a role like Magneto in X2 - working with Superman to overcome a greater evil. I'll give Singer one piece of advice though (Like I'm in the position to! ), and that is to knock some sense in Kate Bosworth (Left)! Her Lois Lane just doesn't work. She's not peppy, quirky or interesting. Look back at the original Superman: The Movie and Superman 2. Margot Kidder was no beauty queen, but she had such great comic timing and an eccentric approach to the character that we could see why Clark/Supes would fall for her. She was spunky & adorable, as well as a goofy best friend. Bosworth, on the other hand, is mopey and bland. She'd be overlooked in a Staples department store. Bosworth should be forced to spend a month shadowing Kidder (Even if it means living in the bushes in stranger's yards, as Kidder did in her mid 90's breakdown... Hmmm... That's really mean of me! I still love ya Margot! ), and get this character fixed. She's the only thing holding the series back. I hope Singer (Right) keeps the darker edge though. I liked his positioning of Superman as a Christ-figure. It wa s interesting and made the character seem more real in this day and age. I loved the first two Chris Reeves Superman's, but they wouldn't work very well today. The 2nd two Reeves films wouldn't work either, but then they didn't work back then... God, Nuclear Man *shudders*). I like where Singer has taken it and I hope he doesn't wuss out due to a few vocal complaints from fanboys. We've seen the original films/Lois & Clark/Smallville takes, let's see where Singer can take this! Nobody's complaining about the differences between Burton's Batman films and Chris Nolan's new Bat-films (Though, they did complain about Schumacher's Batman flicks, and I joined in their fury and still remain bitter!). Let the man tell his story and if you don't like it, wait for the next storyteller to give his interpretation! ...But then I loved Superman Returns, so I'm biased! Ha! 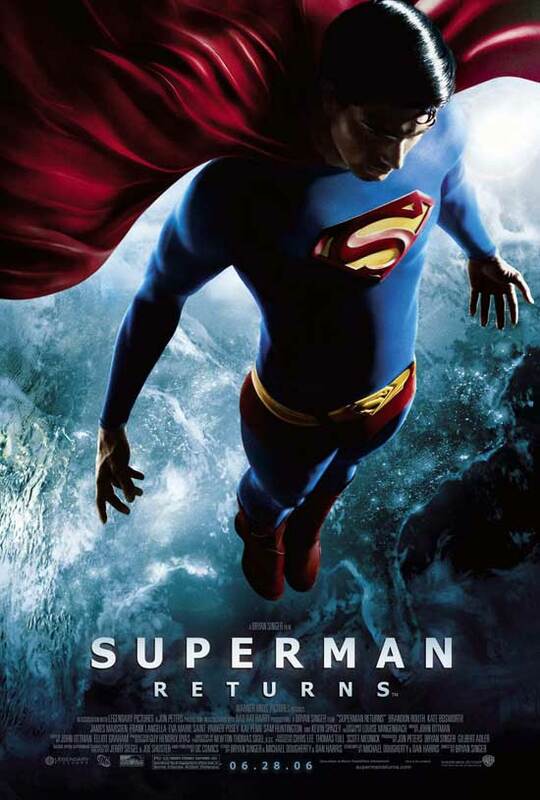 By the way, if you haven't seen Superman Returns yet, make sure to rent it when it comes out on Nov. 28th. Oh, and if you know Kate Bosworth tell her to rent Superman 1 or 2! As always (or se it seems), the B story of the day is here to draw your attention to a trailer to a neat little movie that shows real promise. I don't know how many of you recall the gritty 2002 cop thriller Narc... It was the one with Ray Liotta as a really dirty cop and Jason Patric as his morally upright partner. It was faaaaaaaaaaaaaaar better than the similar Training Day (Although Liotta didn't get to yell "King Kong Ain't Got Sh*t On Me!"... That probably woulda gotten him an Oscar like Denzel...). Either way, Narc director Joe Carnahan has finally put together his follow-up film (after leaving Mission: Impossible III during stalled development) and it's called Smokin' Aces! It's a frenetic, cool looking crime thriller starring a really great assortment of quirky actors. It stars Ben Affleck (Daredevil, Chasing Amy), Jason Bateman (Arrested Development - The Greatest Show Of All Time!!! ), Alicia Keys, Andy Garcia (Ocean's Eleven, Untouchables), Jeremy Piven (TV's Entourage, Very Bad Things), rapper Common, Ray Liotta (Narc, Goodfellas) and Ryan Reynolds (Blade: Trinity, Waiting...). So, yeah, an eclectic cast, in what very may well be one of the sleeper hits of the spring. Do yourself a favor and check out the Smokin' Aces trailer: http://movies.yahoo.com/feature/smokinacesqt1.html. Because, let's face it: The world hasn't been the same without Affleck in the limelight! Remember: He's ain't Benny From Tha Block no mo'! Let's welcome him back with open arms. Okay, that's my bit for tonight. I wasn't even going to do one, but daylight savings got me that extra hour of writing time! Hope you all are having a great weekend! I'll post again on Monday! *EDIT*: This post was supposed to be up Saturday night but blogger.com was all sketchy. I know many of you wept, possibly finding solace in the good book... Hopefully this doesn't become a regular occurence (The Blogger.com malfunctioning, not the finding solace in the good book...). Look! It's Spock swimming with the whales! Affleck was the bomb in Phantoms! SPIDER-MAN 3: An Eye-full Of Venom!